Founders: Paramdeep Singh, Nikhil Patwari, Apurv Gupta, Divir Tiwari, and Peeyush Jain. In developing economies like India, Africa, South-East Asia, Russia, etc. managing sales has been a herculean task, historically. They usually employ a massive sales force, with the help of distribution channels (traders, stockist, distributor, franchise, etc.) to the point of sales location in order to offer their product for the consumption to an end customer like you and me. The process of managing such a big team involves a lot of paperwork and has been traditionally done with a lot of human time effort. Field Assist brings an innovative approach to manage, optimize and increase sales effectiveness with the help of an efficient mobile app, MIS dashboard and statistical tools to handle the tons of data generated throughout this process. It aims to make the system more dynamic, which could easily identify the gaps based on better data visualization, deep and rich analytics. Thus helping the higher management to take cognizant actions for overall improvement. The product consists of all features which are expected in a Sales Automation tool such as Catalogue, Sales Capturing, Stock Taking, Outlet History, Expense Submission, Field Visibility, Live data, etc. The Android application is designed in a way that it can run on any low-end android phones so that even after compiling so many data and communicating with GPS the field staff doesn’t have to worry about battery life. This helped them to reach out to SMEs which cannot invest in high-end devices. Field Assist App – Used by Field Staff for Intelligent Sales. Field Assist Dashboard – Used by Managers and Back End Staff for report generation and data analysis. Coverage– It enables the company to track and monitor the progress of Field Staff. A point of sale like Order Booking, Stock Collection, and Payment Information. Survey– It enables the company to collect different type of data at any Point of Sale. Data Visualization/Analytics– It gives the company a better picture of the data generated in the field which will help them to define KPI’s of their business, monitor them and take necessary action on exceptions generated. The complete data resides on Microsoft Azure Cloud Platform on Enterprise Reserved Instances to ensure the security of all the company’s data. Paramdeep Singh, CEO – A Mechanical Engineer, with 8 years of entrepreneurial experience in FMCG Industry. Nikhil Patwari, COO – A Mining Engineer from IIT Dhanbad, heads the Operations. Apurv Gupta, Co-founder and CTO – An Electronics Engineer from IIT Dhanbad, heads the Product segment of the company. Divir Tiwari, Co-Founder and CBDO – A Mining Engineer from IIT Dhanbad, heads the Business Development division of the organization. Peeyush Jain, Co-Founder and CMO – An Electronics Engineer from IIT Dhanbad, heads marketing division of the company. 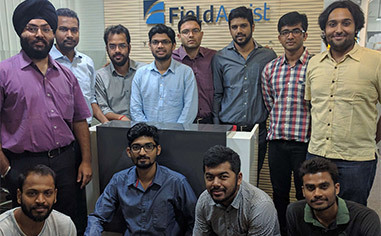 Field Assist was launched in 2013, and at during the initial phases, they had difficulties in convincing companies to adopt the platform due to both infrastructure issues and market visibility of the company. But it started gaining traction within 8-9 months of launch, and in the last couple of years, the company has captured more than 50 national-international brands mainly from Apparels, FMCG, and CPG industry. Some of the largest clients include ITC, Raymond, Levis, Mahindra &amp; Mahindra, DS Group, Star TV, GD Foods, Anmol Bakers Biscuits. As there is an enormous opportunity in the market and the team is operating after government’s push to Make in India campaign and high growth in MSME sector, they see Field Assist as an essential tool in future for doing traditional trade which still occupies 95% in South Asia. And there are similar opportunities that are present in other developing countries as well, and the team has already started expanding their base outside of India. The parent company Field Assist was incubated in CIIE (Entrepreneurship Cell of IIMA) in 2010 and received seed funding from there for their QR Code Marketing platform. In January 2014, Field Assist got selected for 9th batch of Startup Chile and received a grant of 40K USD. Apart from that they recently secured debt funding from SIDBI. Paramdeep says that they got their first customer when they created the first working prototype of Field Assist for one of their existing clients of their QR code marketing platform. After that, they went to the market and built the second version of Field Assist based on the market feedback. Given their entrepreneurial background and team’s diversity and experience, one of the largest socks manufacturers in India gave them the opportunity and implemented Field Assist. He shares the biggest challenge faced in the journey was when the organization was catering to B2B markets in India, most of the times they end up being service companies due to high customization demands from customers and cheap availability of alternate IT resources to build customized solutions. We can definitely make quick money by building custom solutions for enterprises and being a bootstrapped startup it was a very lucrative proposition for the team, but they have tried their best to keep the urge at bay. DLF Cyber City, 3rd Floor Tower B, Cyber Greens, Sector 25A, DLF Phase 3, Gurgaon, Haryana, 122022.